START THE OUTER LIMITS THEME... 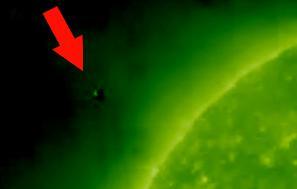 GIGANTIC Metallic object next to the Sun? That particular observation had been made more than a few years ago, but back then no one was paying attention because the photos, I believe, were taken by a private observatory or party. The Dunn Solar Telescope at the Sunspot solar observatory hides most of itself underground. Five days later, the observatory's website confirms the entire facility is closed to both staff and the public until further notice. "The Association of Universities for Research in Astronomy (AURA) who manages the facility is addressing a security issue at this time," AURA spokesperson Shari Lifson said in an emailed statement. "It's a temporary evacuation of the facility. We will open it up as soon as possible." The FBI field offices in Albuquerque and in El Paso, Texas, didn't respond to a request for comment. Meanwhile, in the vacuum created by the lack of an official explanation, plenty of people on YouTube and social media and in tabloid publications have stepped in to suggest their own. Some say the evacuation could be part of a government effort to cover up a discovery involving aliens, an impending solar flare or something else extra-planetary. Others on Reddit and elsewhere think the security issue may involve a foreign power attempting to use the observatory's antennas to spy on nearby White Sands Missile Range. The observatory was built by the military in 1947 when it realized the sun could interfere with radio communications. The National Science Foundation ran the facility from the 1960s until this year, when operation was transferred to AURA and New Mexico State University. Hopefully it isn't now in the process of being unwillfully transferred to aliens or foreign spies. We shall see. 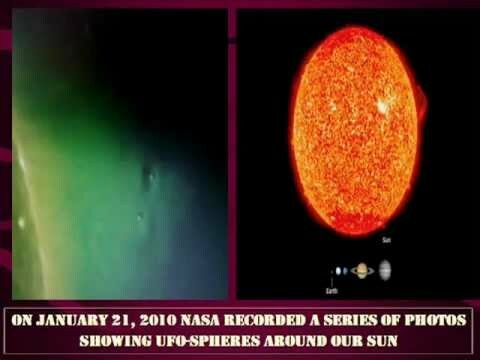 Who remembers those mysterious planet sized spheres that showed up around the sun a few years ago? Was a hot topic here and on the old now defunct watchermeetup.50.forumer.com forum that preceded this one for a long while. Is this related to anything in Springs topic? Who knows? Hey, just sayin'. Thanks again Tiger Droppings. I just verified a few of the links and web cams were offline at every one of 'em. something is coming, or we are being baited into THINKING something is coming....i feel "something wicked this way comes"....who wrote that?....i can't remember...i looked it up and its ray bradbury!...now, ain't that something? Ray Bradbury - The Martian Chronicles. His absolute BEST work ever! The original version, not the updated version where the dates are changed and the chapter titled "June 2003: Way in the Middle of the Air" was deleted to please the politically correct hacks. Ohhhh, the dreaded "N" word. Literature should be left alone and always published in original form. I could really RANT HARD about this! Fahrenheit 451 is my second favorite Bradbury book. Excerpt from "June 2003: Way in the Middle of the Air" I screen capped for y'all. You can read the entire book at the link below. BROADCAST TONITE (9/13) 94 MINUTES FROM NOW. CAN BE HEARD AFTER AS WELL. Thanks, Dove. I won't be here to hear it live but you can bet I'll be downloading it when I return tonight. OH ! Thank ya'll ! Ohhhhh, it embeds. Didn't know you could do that on BlogTalk. Must be new. Yes, thanks Dove, I missed them too...used to listen to them all the time too, glad you found them for us again. Subject: Re: START THE OUTER LIMITS THEME... 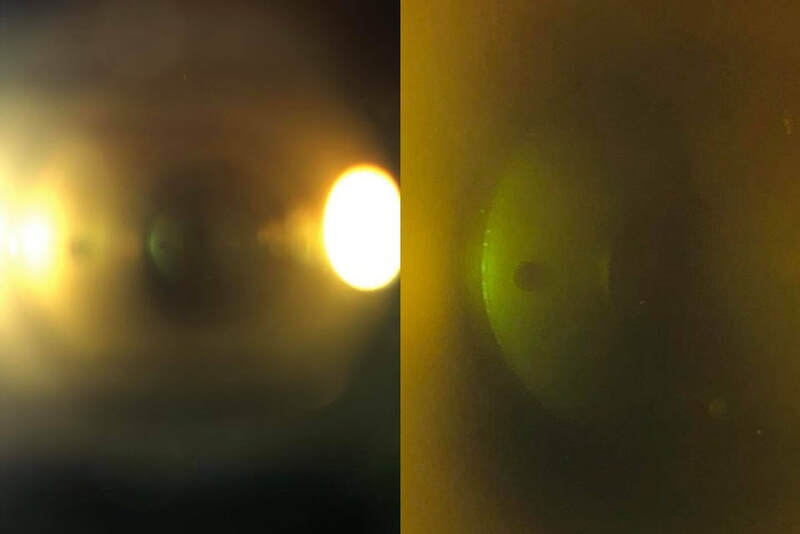 GIGANTIC Metallic object next to the Sun?